Novelty songs about the battle of the sexes are not new -- and this item, around a century old, is proof positive of that statement. Characteristically sung by the bemused male, there are nearly enough of these to represent a genre. Regarding "You Can't Get Along With 'em or Without 'em (You've Got To Have 'em, That's All), we have to admit that this looks a little hard to fit into a musical line. But never underestimate the ingenuity of Tin Pan Alley in making things like this happen. Fred Fisher and Grant Clarke certainly pulled it off! 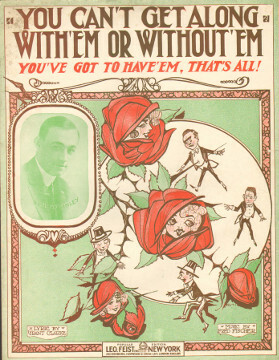 We are happy to offer the original sheet music of You Can't Get Along With 'em or Without 'em for download as a PDF file. The download includes the colorful original cover, and the price is $3.50. Charge it to your credit card or PayPal account. Thanks to the Library of Congress, you can stream the Victor Record recording of this classic. The tenor in this performance is Billy Murray, and the orchestra is conducted by Walter B. Rogers. We're still a little amazed that this unwieldy title fit the music. But we admit that we sort of like it. Do you? Want to try it on your own piano (or other period-appropriate musical instrument)? Perhaps that old upright piano in your own front parlor? Then, by all means, get the sheet music!